My husband's birthday was on July 29th. I didn't bake him anything for his birthday because we had to travel to North Carolina that weekend. 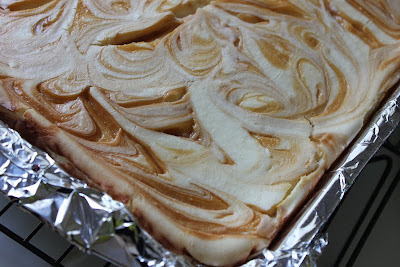 But, although it was a little belated, I did get around to baking him a cheesecake for his birthday. Cheesecake is one of his favorite desserts. And, since I was celebrating Autumn in August, I decided on a cheesecake with one of my favorite flavors of fall - caramel. You can keep your chocolate sauce. I will take caramel sauce over it every time. I love the buttery sweetness of it. This recipe is from one of my favorite bookazines, Taste of Home's Fall Baking 2009. 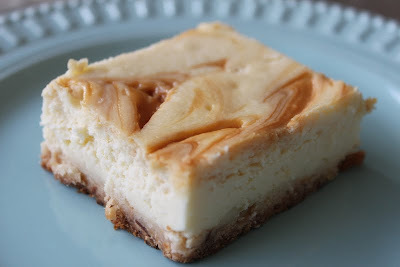 Just look at those caramel valleys cutting through the creamy surface of the cheesecake. Beautiful! Press into a lightly greased 13"x9" baking dish. Bake at 350 degrees for 10-12 minutes or until lightly browned. Cool on a wire rack. Spread filling over crust. 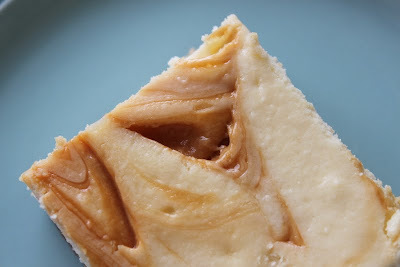 Drizzle with caramel topping; gently cut through the filling with a knife to swirl. Bake at 350 degrees for 40-45 minutes or until center is almost set. Cool on a wire rack for 1-1/2 hours. Cover and refrigerate for at least 6 hours before serving. I supposed you could pour more caramel sauce on top of the cheesecake when you serve it if you like that kind of thing. 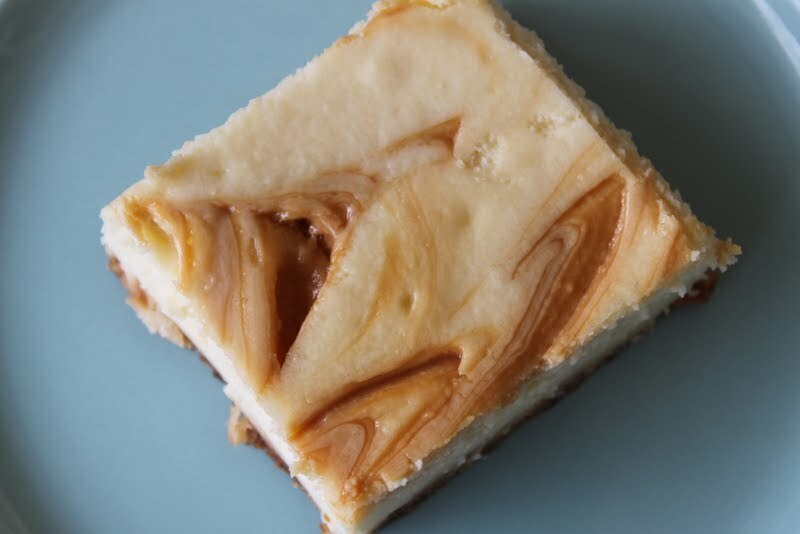 Caramel has certainly elevated desserts over the recent years and this is definitely one I'll try. I can just imagine it with a spiced apple compote served along to give it that caramel apple taste! I totally LOVE your blog! :D This looks so scrumptious, thank you for sharing!! This looks divine! I can't wait to try this...very soon!